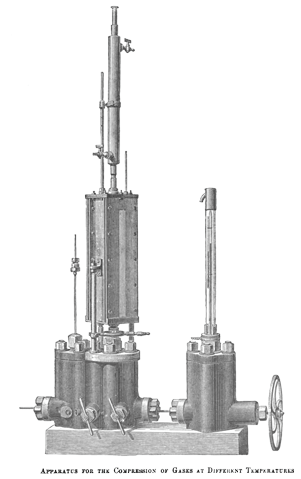 Two units, ( late 19th – 21st century), used in the study of gases at high pressures. The units are related reciprocally; which one is meant is evident from the context. Symbol, “amg” and more recently “am”². The amagats are named for the French physicist Émile Hilaire Amagat (1841– 1915), who spent years studying gases under pressure and used the unit of volume in his publications, without, however, calling it an “amagat”. It was subsequently taken up by Kammerlinne Onnes and other Dutch physicists. Currently it is used, for example, in studying the atmospheres of planets. From Barus, The Laws of Gases. Ordinary density is mass per volume; the amagat unit of density describes particle count per volume. The basis for comparison is the number of particles in the same volume of an ideal gas, at standard temperature and pressure, 1° C and 1 atm. Being a ratio, the amagat is dimensionless; however, the property it measures can be expressed as moles per cubic meter. To convert amagats to moles per cubic meter, multiply by 44.6148 ± 0.004 moles per cubic meter. Like the density amagat, the volume amagat is dimensionless. To convert these amagats to cubic meters per mole, multiply by 0.0224. H. J. Michels, trans., and S. Angus, editor. A note on the Amagat unit of volume. Report PC/D30, IUPAC Thermodynamic Tables Project. London: Thermodynamic Tables Project Centre, Dept. of Chemical Engineering and Chemical Technology, Imperial College of Science and Technology, 1970. Carl Barus, editor and translator. The Laws of Gases. Memoirs by Robert Boyle and E. H. Amagat. Vol. 5, Harper's Scientific Memoirs. New York and London: Harper and Brothers, 1899. The first passage is from Barus's translation of “Mémoire sur la compressibilité des gaz aux fortes pressions”, Annales de Chimie et de Physique, 5th series, vol. 22, pages 858-898, 1881. The second is from his translation of “Mémoires sur l'élasticité et la dilatation des fluides jusqu'aux trés hautes pressions”, Annales de Chimie et de Physique, 6th series, vol. 29, 1893. Guide to the Use of the International System of Units (SI). 1995. Copyright © 2013-2015 Sizes, Inc. All rights reserved. Last revised: 18 December 2015.